One of Hawai‘i’s most spectacular natural treasures is the wide variety of marine fishes that occur in the nearshore waters of the state. Over 400 species of inshore and reef fishes inhabit Hawai‘i’s coastal waters. There is remarkable diversity among these fishes. For example, over fifty species of brightly colored wrasses are found among the reefs, along with nearly thirty species of angelfishes and butterflyfishes. Large predators such as jacks and sharks also inhabit the reef area. Each one of the 400-plus species has its own unique role in the nearshore environment. The coastal waters of the islands feature a number of different habitats, each with its own characteristic marine life. Some fish are at home in sandy bottom areas, others in boulder-strewn waters off rocky shorelines. Tidepools provide “nursery” areas for young fish of many species. The coral reef is the best known and most impressive of Hawai‘i’s nearshore habitats. A healthy reef provides fish with abundant food resources and protection from predators. It is for this reason that reefs attract a great deal of marine life. The individual coral animals which create much of the reef are sensitive to changes in water quality, as are the microorganisms which form the base of the food chain. A reef habitat that becomes degraded as a result of pollution or siltation will lose its ability to support a diversity of marine life. Protecting reef and other nearshore ecosystems is necessary and challenging. 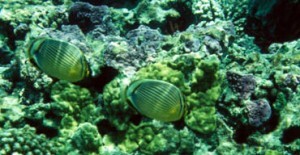 Nearshore fishes have always played important roles in the lifestyles of Hawai‘i’s people. Many of these fishes are commercially valuable, some as food fish and some as aquarium pets. Recreational fishing is enjoyed by many local residents. Snorkeling and SCUBA diving are popular activities with residents and tourists, and offer excellent opportunities to see reef fish in their natural environment. Hawai‘i’s recent history has shown that the state’s growing population can have an adverse effect on nearshore fish populations. Protecting this important resource for the enjoyment of future generations is essential. Ideally, management of the resource should balance the needs of different user groups, but the welfare of the marine environment on which its inhabitants depend must be the most important consideration. Marine Life Conservation Districts (MLCDs) are designed to conserve and replenish marine resources. MLCDs allow only limited fishing and other consumptive uses, or prohibit such uses entirely. They provide fish and other aquatic life with a protected area in which to grow and reproduce, and are home to a great variety of species. Fishes in most MLCDs are fairly tame and often show little fear of humans. MLCDs are most popular as sites for snorkeling, diving and underwater photography. MLCDs were introduced to Hawai‘i in the fall of 1967 with Hanauma Bay on O‘ahu. The resulting increase in fish populations was phenomenal, and the bay has become world famous. At the present time there are eleven MLCDs statewide, and other sites are being considered as well. Marine Life Conservation Districts are established by the state’s Department of Land and Natural Resources (DLNR), as authorized by Chapter 190 of the Hawai‘i Revised Statutes. Suggestions for areas to be included in the MLCD system may come from the State Legislature or the general public. In addition, the DLNR’s Division of Aquatic Resources (DAR) regularly conducts surveys of marine ecosystems throughout the state, and may recommend MLCD status for areas that appear particularly promising. Once an area is recommended for designation as an MLCD, it is evaluated by the DAR with regard to a number of criteria. These include public accessibility, marine life and future potential values, safety from a public usage standpoint, compatibility with adjoining area usage, and minimal environmental or ecological changes from the undisturbed natural state. In addition, the area should have clearly defined boundaries so that it is easily recognizable for compliance and enforcement. The area must also be of suitable size – large enough so that fish populations can be restored even with ongoing fishing activity outside the MLCD, but small enough so that fishermen are not denied the use of unreasonably vast fishing areas. If the recommended area meets the above criteria, the DAR conducts a thorough investigation consisting of bottom topography and fish surveys. Input from the general public, citizen groups, and governmental and private agencies is also considered. Public meetings are held, after which regulations for the area are drawn up. A public hearing is then held on the proposed regulations. Final approval is obtained from the Board of Land and Natural Resources and the governor. Since the purpose of MLCDs is to protect marine life to the greatest extent possible, the taking of any type of living material (fishes, eggs, shells, corals, algae, etc.) and non-living habitat material (sand, rocks, coral skeletons, etc.) is generally restricted, if it is permitted at all. This fosters non-consumptive uses of the area, such as swimming, snorkeling and diving. Fishing may be allowed subject to certain types of gear restrictions, which result from input received during the public meeting process. However, from a conservation standpoint (and to avoid confusion about the rules), it may be desirable to prohibit all consumptive use in future MLCDs. Signs located at each MLCD indicate the District’s boundaries and describe regulations for the area. For further information you can consult the current Hawai‘i Fishing Regulations booklet, or contact the nearest DAR office.